Hanson Wraps a Decade into a Complete Sound Ten years ago, Hanson's "MMMBop" was a massive hit among teenage girls. But unlike most "boy bands," the trio wrote its own songs and still does. The Hanson brothers are in their 20s now, they run their own label, and they just released a new CD, The Walk. Hanson's "MMMBop" was all over the radio in the summer of 1997. The trio and its mega-hit were enormously popular among teenage girls, but Hanson was different from the other "boy bands" of the time: It wrote its own material and still does. Just about everything else about the band has changed, though — even "MMMBop." The Hanson brothers are in their 20s now. They run their own label, 3CG Records, and they're on tour again behind their new CD, The Walk. At first listen, it appears that the band has eschewed their pure-pop past for a more rock-leaning sound, but guitarist Isaac Hanson suggests that Hanson "aggressively tried to take the previous 10 years worth of material and wrap it up into one complete sound." While keyboardist Taylor Hanson has always been Hanson's primary songwriter, he says that the group works in a spirit of collaboration. "I think one aspect of this band that's so unique — because we all write — is that it pulls the records into a more eclectic place." Yet on The Walk, the band aimed to push its creativity by recording live in the studio and limiting its "colors," according to Taylor Hanson. By imposing these restrictions, Hanson wanted to see how its influences could jell in a more confined environment. The band has a great sense of humor about its early image. The initial criticism and ridicule of Hanson's sugary-sweet pop songs and androgynous appearance (if only for its members' young age) culminated in a Saturday Night Live sketch featuring the band itself with Will Ferrell and host Helen Hunt holding Hanson at gunpoint, forcing the trio to endlessly listen to "MMMBop" until insane. "You know what? 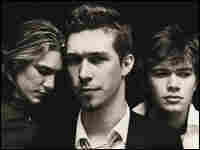 We've always been proud of what we've done," Isaac Hanson says. "It's hard to complain when you say, 'We're gonna go to the clip where Helen Hunt and Will Ferrell are on Saturday Night Live making fun of your song.'" It's also a testament to the staying power of the band and its fans that Hanson has looked past its initial pop-culture success and found stable ground. The group's core audience still includes teenage girls, but other listeners have found much to enjoy in Hanson's sound, which has much in common with Stevie Wonder, Billy Joel and even Radiohead.